Summary: The Sky Crawlers can be commended for going deeper than any Bay blockbuster with an intellect that will have you wanting more long after the surprise at the end of the credits. Mamoru Oshii is no stranger to ambitious anime projects. His visionary pair of Ghost in the Shell cyberpunk movies were marvels of storytelling and animated technology, blending 2-D animation with CGI. Here he returns with another epic, The Sky Crawlers, based on Mori Hiroshi’s five-part series of bestselling novels set in an alternative historical period chronicling the lives of a group of young aerial fighter pilots involved in a seemingly never-ending war. Once again the themes of age, innocence and conscious thought are prevalent, this time set to a backdrop of spectacular dogfights. At the centre of The Sky Crawlers is a fearless young pilot named Yuichi Kannami who arrives at his nation’s airbase for duty. He spent his childhood on an intense flight training course, building up an impressive array of skills in command of a fighter plane and hardly bats an eyelid when despatching the bad guys. Tellingly, the enemy remains an unknown — a sign that to the pilots it matters little who they fight, they must fight whoever they are told and not ask questions. 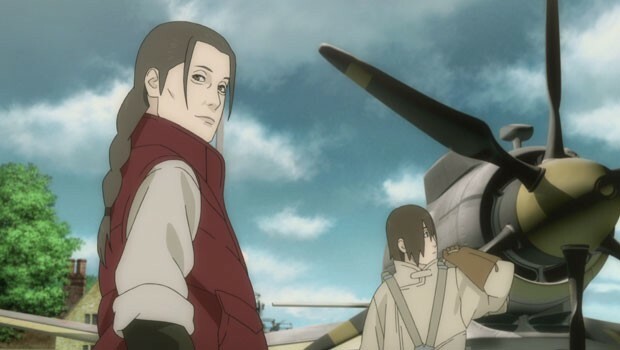 However, when Yuichi gets close to his beautiful female commander Suito Kusanagi, those questions start to creep in with uncomfortable results: she is unwilling to discuss the fate of the pilot he replaced and it seems there are glaring holes in the knowledge of his fellow pilots. Oshii directs The Sky Crawlers with a similar haunting style as that of Ghost in the Shell. Stilted conversations give clues to words not being said and a conspiracy at large while he revels in deep conversations about what it means to feel alive. Revisiting them from a more youthful perspective than the cyborgs of his previous work gives a more fragile voice to the psychological discussions while the talk of why wars are waged and what it means to kill to order are thought-provoking. The aerial action has been carefully crafted for excitement and offer impressive scenes of skylines full of fighter planes: the mix of CGI and 2D animation give depth and a gloss that would make Michael Bay proud. But The Sky Crawlers can be commended for going deeper than any Bay blockbuster with an intellect that will have you wanting more long after the surprise at the end of the credits. Sky’s the Limit: An Interview with Mamoru Oshii, trailers, English and Japanese language options.